Slice, dice, shred, grate, crimping slice, cut julienne, and French fries. Slice, dice, shred, grate, crimping slice, cut julienne and chop, grind, mix, mince, puree and blend. Chop, grind, mix, mince, puree and blend. 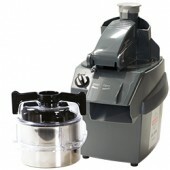 Blends, mixes, whips, stirs, chops and mashes mixtures that are rich in liquids. Why choose a HALLDE Combi Cutter? 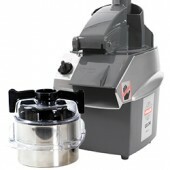 Vertical Cutter Blender Attachment: chops, grinds, mixes, purées, blends and minces meat, aromatic butter, dressings, desserts, purées, pâtés, soups etc. Vegetable Preparation Attachment: slices, dices, grates, shreds, cuts julienne and crimping slicers in a variety of dimensions depending on model selected. HALLDE’s range suits the smallest café up to medium sized kitchens. In order to give you the best comparison chart, you need to select 2 or 3 products.